The spirit of accommodation between the state and soldiers must never be strained to the limit where the armed forces’ discipline and steadfast conduct get compromised. The current duelling between the government and veterans is an ugly sight. 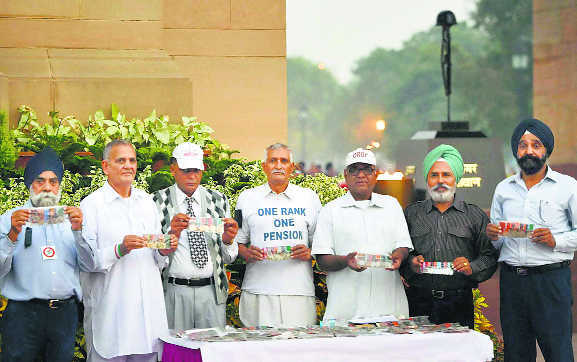 Ex-servicemen returning their medals during the agitation for ‘one rank, one pension’ at Amar Jawan Jyoti in New Delhi. PTI/fileAbout two months ago, the Western Command Headquarters inaugurated their first “Old-Age Home” at Panchkula (Haryana) as an internal initiative. Napoleon had set up the first state sponsored old-age home in the heart of Paris around 1790, not far from the Arc de Triomphe. Ultimately it became Les Invalides, a state-funded establishment for retired soldiers (especially those devoid of any living kin) and its upkeep was patronised by the Emperor (head of state in this case) himself! Admittedly, times have changed since, but that idea of the state and soldier bonding in a kind of camaraderie should certainly not be out of place, even today. Closer to our times, my mind goes back to one among the several mega-celebrations organised in the UK in 1995 on the occasion of the 50th anniversary of the end of WW-II. It was appropriate that the Indian contingent to the celebrations would include soldiers decorated with the Victoria Cross (VC), the foremost British award for gallantry on the battlefield. Of the 32 Indian awardees of the VC during the war, only 11 were alive in 1995. Four VC veterans could not undertake the journey to the UK due to age and infirmness, but the remaining seven were glad to participate. Of these, the six doughty Gorkha veterans had various grades of flab around their midriffs but the seventh, Subedar Major (Honorary Captain) Umrao Singh, over six-foot tall, of ram-rod stance, flat bellied and broad chested, became the cynosure of all eyes. The way he walked up to Queen Elizabeth in the Audience Hall of Buckingham Palace, any drill sergeant-major from the Coldstream Guards Brigade would have been envious. Little wonder that breaking precedence of ceremonial etiquette, the gathering burst into spontaneous applause! The following day when Prime Minister John Major happened to drive past some invitees and from the corner of his eye caught the sun glinting on their VC medals, the Prime Minister had his car halt. Walking up to the veterans, he saluted and greeted each with a firm handshake. In the UK, if a man (nationality notwithstanding) with a VC or MC pinned on the chest were to walk out, chances are that nine out of 10 passersby would halt mid-stride, smile and nod in salutation. In India, even though righteous wars and warriors have been glorified by the gods through the epic Mahabharata, yet not one in a thousand Indians will know what a PVC, MVC or VrC looks like, leave alone greet its bearer. Dismissing his car, John Major escorted them to the venue of the function. Striking a conversation, he inquired if the veterans had any hardships that needed attention. Umrao Singh was prompt to state that although the prevalent currency exchange rate was Rs 50 to a pound, yet the VC pension handed out to them was at the paltry exchange rate of 1945. He asked, would it not be fair to revise their pension, which was last fixed in 1945, and bring it on a par with their counterparts in the UK? John Major was visibly upset at the injustice and promised that Her Majesty’s Government would rectify it. Six months later in March 1996, Christopher Thomas, South Asia correspondent of The Times (London), drove to Umrao Singh’s home at Palra village (Jhajjar district, Haryana) with the news that Her Majesty’s Government had enhanced their VC pension from 100 pounds per annum to 1,300 pounds! And it would be admitted at that day’s prevailing currency exchange rate or a subsequent rate, whichever was higher, but never lower than that day’s! Obviously, Umrao Singh was astounded at this windfall. He rushed to his wife who was frying “parathas” on a wood fire and declared, “Vimla, now we can live in style.” Umrao Singh brought out an unopened bottle of rum. He filled two large steel tumblers almost to the brim. Handing one to Christopher and holding his own in the left hand, Umrao came to attention, and giving a smart salute said, “This is for John Major, the Prime Minister of Britain! He has made me happy and proud.” He could now pass his allotted days with the dignity due to a VC. He passed away on November 22, 2005. When Umrao Singh was in dire financial straits, a VC collector from the UK had made him an offer of 35,000 pounds. Umrao Singh’s response was, “If I give away my medal, I will dishonour the soldiers who fought and died alongside me.” This is how soldiers cherish their medals. Of Prime Minister Narendra Modi’s three Ds — democracy, demography and demand — democracy is hobbling under the weight of its own conflicts. The Indian republic seems stuck in quicksand of its own making. It trudges along, powered by people with long experience in adapting to dysfunctional systems. But hope that the churn of the last few years would lead to political maturity, institutional regeneration, economic dynamism and new social relations is fast dissipating. We had reached a point where the long run had caught up with us; short-term palliatives were not going to be enough to confront the enormity of our development challenges. But instead of a cycle of regeneration, there is now a potential storm gathering from many directions that threatens to cloud India’s prospects. Take the political storm first. The political immaturity of India’s ruling parties at display is enough to the dent the confidence of the most ardent optimist. Competition, even a degree of mudslinging, is the life of a democracy. But we have taken it to unconscionable extremes and tied it to petty causes. 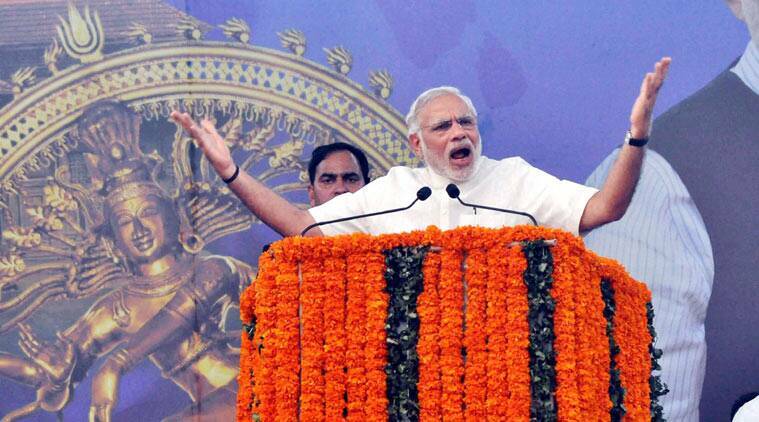 The BJP had a historic mandate to set a new tone in politics. As a government, it should go after corruption. But this quest would be more credible if it applied the same standards to the ruling party, as to the Opposition, if it did not reek of vendetta against opponents and protection of one’s own. What you get is not a polity on the path of regeneration, but a state at the mercy of arbitrary will. The Congress continues to show the most shocking subordination of the political to the personal that has marred its history. Its charges against the BJP would be far more credible, and it would cut a sympathetic political force, if it were not adamant about sabotaging every institution for the protection of the first family. The courts will decide the truth of the National Herald case. But the Congress’s protestations that it is blocking Parliament to defend some high principle are contemptibly laughable. The AAP has been transformed from a harbinger of progressive institutional change to a party with many routine pathologies of our political system. The regional parties, with some exceptions, provide a balance of power but little else. A political system with this degree of mutual recrimination, a sense of vulnerability because of complicity in acts of corruption and a default political strategy of blockade and vendetta that permits little constructive dialogue is stalling India. It has been a common refrain among defense and foreign policy opinion makers over the years to warn that if the U.S. doesn’t maintain a muscular foreign policy, it “sends a message of weakness” to our enemies and puts our security at risk. The stark and increasingly undeniable evidence, however, exposes the truth to be quite the opposite. Such arguments are tantamount to saying with sincerity that the best way to put out a house fire is by dousing it with gasoline. The latest evidence of this absurd logic is found in the off-the-radar security situation spiraling out of control in Afghanistan. While most eyes have been riveted on the Islamic State (ISIS) in Syria and Iraq, the Taliban in Afghanistan have steadily increased in power while the Afghan government continues to founder and the Afghan security forces remain only marginally capable. Our failed strategies are not simply academic or “regrettable,” but pose serious risks to U.S. national security beyond just the terrorist threat on the ground in Afghanistan. Respected Pakistani journalist Ahmed Rashid reported on December 12 that things had gotten so bad in Afghanistan that a Taliban return to power was “no longer improbable.” He also said that so long as the rising Taliban and the spiraling Afghan government continue on current trajectories, the “result will be further destabilization of Pakistan and Central Asia, creating the perfect conditions for the expansion of the Islamic State.” The worst, he wrote, “may well be yet to come.” After fourteen years of effort, hundreds of billions, and the loss of thousands of U.S. service personnel, how could things be this bad? JALALABAD, Afghanistan (AP) — Rahman Wali’s younger brother was one of 10 Afghan men forced by Islamic State militants to kneel over bombs buried in the soil in a lush green valley in eastern Nangarhar province. The extremists then detonated the bombs, turning the pastoral countryside into a scene of horror. The August killings were recorded on camera and posted on social media like so many IS atrocities across the Mideast — reflecting how the Islamic State is exporting its particular brand of cruelty as the group seeks to enlarge its footprint in Afghanistan. It was through the macabre video that 44-year-old Wali learned the fate of his brother, Rahman Gul, an imam in their remote Shinwar district bordering Pakistan. Gul had been kidnapped weeks earlier, together with his wife and six children who were quickly set free. After his brother’s death, Wali and his family fled to the provincial capital of Jalalabad, seeking refuge in a makeshift camp with thousands of others who left their homes in the valleys hugging the border to escape what is turning out to be an increasingly vicious war for control of the region between the Taliban and fighters of Afghanistan’s IS affiliate.Reports of an IS presence in Afghanistan first emerged early this year in southern Helmand province, where recruiters believed to have links to the IS leadership in Syria were killed by a U.S. drone strike in February. In the summer, extremists pledging allegiance to IS also surfaced in Nangarhar, where they challenged the Taliban in border clashes. After see-sawing between the two groups, four districts — Achin, Nazyan, Bati Kot and Spin Gar — fell under IS control, according to Gen. John F. Campbell, the U.S. commander of American and NATO forces in Afghanistan. Almost two years after the start of the conflict in Ukraine, it is clear that China, not Russia, is the real victor. This assertion may strike readers as bizarre since China’s vital interests are not engaged in this war, nor does it participate in any of the negotiations. Nevertheless this judgment is already unassailable. Russia may have won some territory and grievously wounded Ukraine but it has incurred terrible economic and political costs. And many of its losses have been China’s gains. 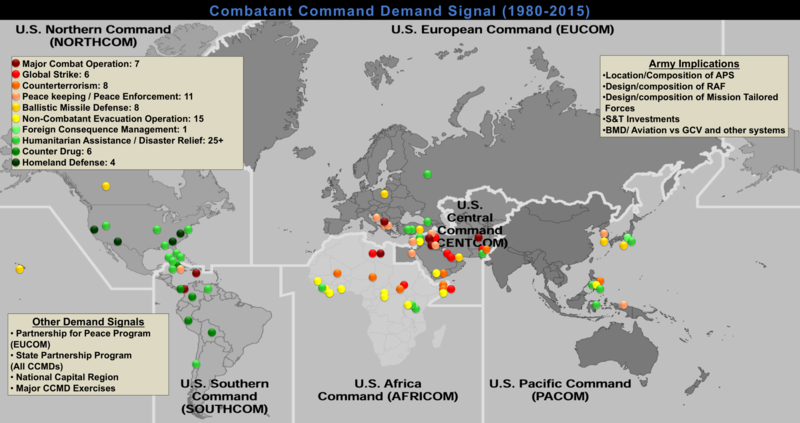 Such a situation – where a non-combatant power wins the spoils of war – is not unprecedented. In the light of European history, Prussia was the real victor of the first Crimean war (1853-56), though it did not fire a shot. Prussia profited from the Crimean war’s weakening of the post-Napoleonic order to unify the German states into an empire that changed the balance of power in Europe. In Asia, China’s gains are most apparent. Following the return of Shinzo Abe to power as prime minister, Japan and Russia were heading for a rapprochement. An important element in this was and is the two governments’ shared apprehensions about China’s growing power in Asia. But because of Russia’s seizure of territory in Ukraine, Washington has brought considerable pressure to bear on Tokyo to join, however reluctantly, in the sanctions against Moscow. In October 2015, despite Tokyo’s long courtship of Russia, Japan announced that President Putin would not visit the country in 2015. China’s direct gains are even more visible in economic relations with Russia and in Central Asia. The terms of a Russo-Chinese energy deal of May 2014 have remained a secret but it is widely believed that China will obtain gas at cost price, hardly an economic gain for Russia. In July the two governments said that they would not sign a second gas deal later this year despite previously agreeing to do so. It turns out Robert Thurman, father of actress Uma Thurman and the first White person to become a gyeshe,1 holds lessons on Tibetan Buddhism for young Tibetan Americans. He begins his lesson by asking the young teens to raise their hands if they are Buddhist and without doubt they all raise their hands, to which he responds by laughing at them. The world may be a long way off from defeating ISIS, which Thursday showed its resilience by launching its first major offensive in Northern Iraq in months, but the chaos sown by the group is also putting pressure on longtime foes to resolve some seemingly intractable conflicts so as to be more united against the ISIS threat. Libya’s rival politicians signed a deal at U.N.-brokered talks in Morocco on Thursday to form a unity government. Disagreements remain and the deal itself won’t resolve the country’s ongoing violence—for one thing, none of the armed groups participating in the fighting were represented at the talks—but it could bring to an end a chaotic period in which Libya has had two rival governments. Talks to resolve the situation have been going on for months, but diplomats have been applying more pressure lately thanks in part to the threat of the Islamic State, which has gained a foothold in the country, particularly around the central city of Sirte. As long as the country has two governments each backed by a patchwork of rival militias, ISIS is going to continue to take advantage. Neither hacker attacks from Anonymous nor Donald Trump shutting down the Internet can ultimately ensure ISIS’s demise. Even those inclined to a more jaundiced “pity they can’t both lose” perspective on this nascent Anonymous-ISIS feud can appreciate the moxie and verve with which Anonymous seems to have entered it. Unfortunately, its efforts will, at best, only frustrate the Islamic State. Indeed, the cockiness it brings to this battle reflects the same facile faith in purportedly inevitable modernity that has marked much of the physical Western war effort against the Islamic State since the latter’s emergence. Is ISIS Capable Of Governing Its Caliphate? It is in the strategic interest of the international community to let ISIS collapse from its inherent contradictions, instead of crushing it militarily. We’re fighting a failed state in the making, one that will implode if merely contained, and will collapse even faster under coordinated economic and military pressure from its neighbours.” They see in its collapse “ideological benefits. No one uses communism to rally rebels anymore (save for a few small groups in India); the collapse of communist states in the 1990s demonstrated to everyone how ineffective the ideology was at running a modern economy. As Ronald Reagan correctly saw, allowing communism to collapse of its inherent contradictions would discredit it forever…..As the Soviet Union was to communism, so ISIL is to jihadism. If one goes deeper into the problem, one would find the professors’ view very realistic and pragmatic in approach. Every political violence has some political objective to achieve. As with Al Qaida or Muslim Brotherhood, ISIS’ political objective is to establish a caliphate with a Caliph for all the Muslims of the world. In fact, within three weeks of its taking control over the Iraqi city Mosul, ISIS declared Abu Bakr al-Baghdadi its Caliph, for the first time after collapse of Ottoman Empire in 1924. 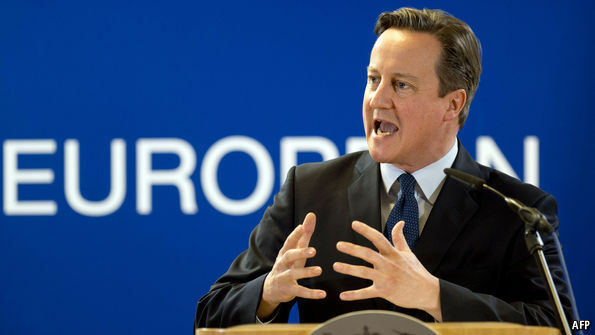 IT WAS described as a “make-or-break” moment for Britain and the European Union. Yet, on the face of it, little happened at last night’s summit of EU leaders to advance Britain’s renegotiation of its membership. There was no breakthrough or compromise. The meeting shifted no one’s position. The summit’s conclusions merely noted that a “political exchange” of views had taken place, and pledged further work before the next get-together, in February. Still, for David Cameron, Britain’s prime minister, it was a modest success. For weeks Mr Cameron has been arguing that officials conducting technical talks on Britain’s demands had got bogged down in details. Britain’s renegotiation, he thought, particularly over migration of EU workers, needed a political energy boost, and he would provide it. At meetings in recent months he has pressed his requests on other European leaders. But last night offered the first chance to speak to them all at once. Over dinner Mr Cameron presented his 27 fellow heads of government with a lengthy speech crafted for him by advisers in Brussels and London. He traced the many changes in Britain since it joined the EU in 1973. He pointed to growing unhappiness with membership among British voters, and his fear that, in the referendum he has promised, they might vote to leave. And he urged those in attendance to understand that a confluence of factors—the EU’s freedom-of-movement rules, Britain’s open labour market, and its unusual “non-contributory” welfare system, which provides generous top-up payments to low-paid workers—was drawing an unsustainable number of European migrants to Britain. 2014 was a major turning point in European history. Russia invaded and annexed Crimea and immediately engaged in an expanded “hybrid” war in Eastern Ukraine with the objective of extending Russian control. There is increasing recognition in the West that Russian aggression, linked with Russia’s nuclear capability, poses a real danger—especially in light of the fact that Russian nuclear doctrine allows for the first use of nuclear weapons in limited conventional wars. U.S. and NATO senior officials have voiced concerns about Russia’s aggressive rhetoric and actions. An enormous disparity between U.S. and Russian efforts to modernize their respective nuclear forces further exacerbates the situation. While Russia expands its nuclear forces, the U.S. continues to make reductions in its own nuclear capability. The U.S. needs to end these reductions, take a firmer line against Russian military expansion, and increase the readiness and availability of existent nuclear capabilities. These changes would cost little or nothing but would help to ensure that Russia does not obtain a substantial nuclear advantage prior to the availability of modernized U.S. nuclear forces. New START is the worst arms control agreement in over 30 years. Under New START, the U.S. is making effectively unilateral reduction in the context of no significant nuclear modernization. While the Obama Administration has changed its views about the Russian threat, its nuclear modernization plans are essentially the same as those adopted in 2010–2011, a period in which the Administration was in denial about the seriousness of the Russian nuclear threat. Russia has a monopoly on battlefield nuclear weapons, naval tactical nuclear weapons, and intermediate-range ground-launched missiles. The U.S. presently has no programs to deter the use of these weapons. Russia’s recreation of pre-INF Treaty capabilities has direct implications for the European crisis. Russia has a ten-to-one numerical advantage and has retained all types of Cold War nuclear weapons. Center for a New American Security (CNAS) Executive Vice President and Director of Studies Shawn Brimley has written a new report, While We Can: Arresting the Erosion of America’s Military Edge. 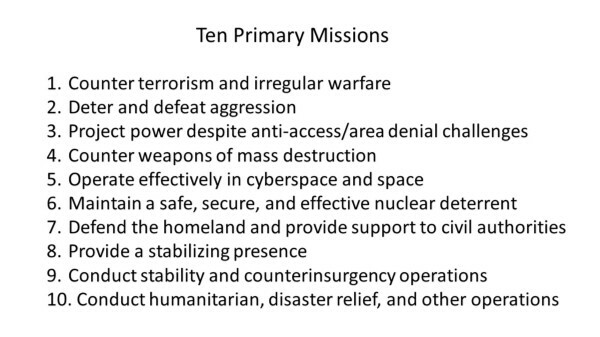 In the report, Brimley argues that the U.S. military edge – particularly in regards to technology – is rapidly eroding. He then makes concrete recommendations for how to rebuild America’s military advantage. America’s armed forces are the most highly trained, best equipped, and most experienced in the world, but the margin of their battlefield superiority is eroding. Whether our armed forces and international allies and partners are a determined dictatorship fighting for its existence, a rising power determined to flex its military power, or a former great power doggedly refusing to cede influence in its near abroad, beneath those headlines is a consistent trend that powerfully influences the nature global security competitions. That trend is the slow but steady erosion of America’s military-technical superiority, which U.S. policymakers have come to assume and our core allies depend on for their own security. Unless that trend is arrested, America’s armed forces will find it more difficult to prevail in future conflicts. Modern American military strategy depends on technological superiority. This was a consistent pillar of strategy during the Cold War, the subsequent interwar years, and the wars of the post-9/11 era. American presidents are rightfully loath to send military personnel into the fray without a clear qualitative edge. What was once an element of deliberate strategy has, over the course of decades, evolved into a presumption of technological superiority. I therefore decided we would have a 1st Brigade Facebook page (for local and interstate families as well as the local community, and the broader Army and media) and I would have a personal commander’s Twitter feed, as a tripwire for our Facebook, but also to tweet interesting professional education articles and blog pieces. I also mandated that each of the seven battalions in the Brigade would be required to start and maintain a unit Facebook page and that each of my unit commanding officers would be required to maintain a Twitter account. But this use of social media needed to be a part of a broader brigade public affairs and engagement approach. We have found local media, local schools and community groups we support, as well as our members’ families and friends, have responded very positively to our approach. 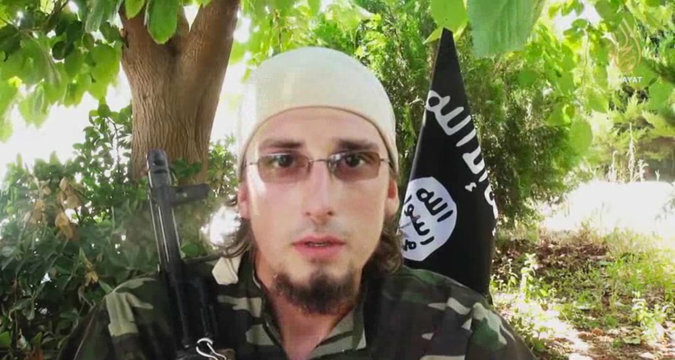 In an Islamic State propaganda video, Andre Poulin, a Canadian, urged others to join the fight. Oslo — AFTER Abu Musab al-Zarqawi, the leader of Al Qaeda in Iraq, the predecessor to the Islamic State, reportedly beheaded the American hostage Nicholas Berg in 2004, he became known in jihadi circles as the Slaughterer. Few people in the West are aware that he also went by the nickname He Who Weeps a Lot. Mr. Zarqawi was known for weeping during prayer and when speaking about Muslim women’s suffering under occupation. The Slaughterer’s brand of radical Islam was brutal even by jihadi standards. Under Mr. Zarqawi’s command, Al Qaeda in Iraq executed so many hostages and killed so many Shiite civilians that Al Qaeda’s leadership reprimanded him. But in his public displays of emotion, He Who Weeps a Lot was not an aberration. For radical Islamists who view crying as a sign of devotion to God, communal sobbing is as common as car bombing. A foreign fighter in Syria who wrote a blog post in March about an imam crying while making an invocation wrote that “brothers were crying with him, some audible, and others would have their tears fall silently.” Jihadis also weep when listening to religious hymns, watching propaganda videos, discussing the plight of Sunni Muslims or talking about the afterlife. Some weep more than others, and those who do are looked up to by those who don’t. Why have tens of thousands of people from around the world chosen to live under the Islamic State’s draconian rule and fight under its black flag? To understand this phenomenon, we must recognize that the world of radical Islam is not just death and destruction. It also encompasses fashion, music, poetry, dream interpretation. In short, jihadism offers its adherents a rich cultural universe in which they can immerse themselves. For a moment this week, Brazilians actually looked up from their mobile phones. On Wednesday evening, a criminal court in Sao Paulo ordered a 48-hour shutdown of Facebook’s popular messaging service WhatsApp, leaving 100 million users bereft, the competition delighted, and lawyers in a lather. True, the hubbub was short-lived: By Thursday afternoon, an appeals court judge reversed the suspension. "It's unreasonable to punish millions of users because of the lapse of one company," Judge Xavier de Souza argued, citing the lower court's "unconstitutional" decision to take down the network after company executives allegedly failed to comply with a court order to turn over data as part of a criminal investigation. Brazilians are no strangers to hyperactive judges. In a country known for its frail safety nets and extremes of wealth and poverty, "social problems often end up in the courtroom," said Wagner Cinelli, an appeals court justice in Rio de Janeiro. Beware the magistrate with a grudge or a mission: A local judge in Brazil can wield remarkable clout over private businesses -- the sort U.S. government officials in their tussles with Silicon Valley over metadata have always dreamed of -- and an ill-conceived ruling can have nationwide repercussions. Add digital technology and the speed of the Internet to the mix, and the potential for turmoil is boundless. Earlier this year, a judge in northeast Brazil similarly ordered telephone operators to suspend WhatsApp for 24 hours when the company refused to hand over client data in another criminal investigation. U.S. intelligence agencies recently identified a Russian cybersecurity firm, which has expertise in testing the network vulnerabilities of the electrical grid, financial markets and other critical infrastructure, as having close ties to Moscow’s Federal Security Service, the civilian intelligence service. The Russian firm is said to have extensive technical experience in security vulnerabilities of supervisory control and data acquisition systems that are used to remotely control critical infrastructure. These systems are employed by both government and private-sector system controllers for equipment running water treatment and distribution, wastewater collection and treatment, oil and gas pipelines, electrical power grids, wind farms and large communication systems. Why Doesn’t the FBI Pay More Attention to ISIS Tweets and Facebook Postings? However, regulation of encryption is unlikely to provide the government with the counterterrorism benefit it says it will. Jihadists’ main tool for planning and executing attacks in recent years has been social media — to which the government has full access — not encrypted messaging. In addition, regulation of one messaging technology will lead to immediate adaptation and the creation of ways to circumvent it.In recent years, smartphones and social media have enabled users from around the world to communicate easily, safely and free of charge. Programs facilitating such communications sprouted, and jihadists — the Islamic State in particular — quickly adopted them as their main means of communication. For over three years, Twitter has been the Islamic State’s most important platform. High-level operatives within the group have used Twitter’s unencrypted direct messaging to recruit, give instructions for donating and plan attacks. Jihadists even rely on Twitter to promote their channels on other platforms, such as Telegram, which supporters would otherwise have difficulty finding. December 18, 2015Tony Cordesman at the Center for Strategic and International Studies (CSIS) here in Washington has placed online an excellent 40-page powerpoint presentation laying out in great detail all of the official data that has been released about global terrorism, such as the number of terrorist attacks around the world, regional breakdowns of terrorist attacks, etc. This is very useful material for serious counterterrorism analysts. How digitized is the United States? Our video explores how digitization is affecting the US economy at all levels. The Combating Terrorism Center (CTC), located at the US Military Academy in West Point, New York, has just released a new study on the short but bloody history of hostage-taking by ISIS and other Islamist militant and terrorist organizations. Below please find a brief synopsis of the report, which can be accessed here. The CTC has published its latest major report, “Held Hostage: Analyses of Kidnapping Across Time and Among Jihadist Organizations” (click here). Written by CTC’s Director of Research Dr. Daniel Milton and Associate CPT Seth Loertscher, the report examines trends related to the kidnapping of Westerners by jihadist groups. The report relies on a newly gathered open-source dataset of the kidnapping of Westerners from 2001-2015, which the CTC publicly released (click here for dataset). The Royal United Service Institute (RUSI) in London has just published and released online a new report called Lone-Actor Terrorism: Literature Review. The report can be accessed here. For those of us who look at terrorism professionally, this study is extremely useful because it reminds us that lone-wolf terrorists have been around for decades before ISIS ever existed. So if you know where to look, there is a fairly rich load of publicly available material about the lone wolf terrorist phenomena, which seeks to understand what drives seemingly normal individuals to commit unspeakable acts of violence on behalf of cause which most of them know little (if anything) about. But the literature confirms what most of us already know - that spotting these people before they engage in terrorist activity is an extremely difficult, if not an impossible proposition. He stood alone, visibly shaken, chain smoking from a pack of borrowed cigarettes. We’d just taken our first hostile fire of the war, some inaccurate mortar rounds that peppered the rocky soil just outside the hastily-strewn concertina wire that formed our defensive perimeter. But that fire, combined with early reports of division casualties, was enough to push him to the edge. I approached him and stood by his side, facing the opposite direction as I watched the soldiers maneuver carefully to keep their distance from their commander. “You doin’ alright?” I asked quietly. “I’m fine,” he answered, his hands shaking noticeably as he took a hard pull on the cigarette. “I’ve never seen you smoke,” I replied.